Andy Rubin, one of the creators of Google's Android software, has launched his own high-end smartphone. Mr Rubin left Google in 2014 to create Playground, a technology investment company. Essential is one of the companies it funds - and the Essential Phone is its first product. The device runs the Android operating system and has gone on sale in the US for $699 (£540). However, it will be difficult to break into the huge market dominance of established brands. Samsung currently has the largest share of the smartphone market, with 21% of global sales, according to analyst firm Gartner. Apple enjoys 14%. Aside from Chinese giants offering subsidised devices, smaller firms have found it difficult to command even single-digit market share - and the Essential Phone's pricing will set it an even greater challenge. But Mr Rubin told an audience in California that he believed there was space in the Android market for another big player besides Samsung, and that Essential was aiming to be a major consumer brand with several products. As well as Phone, Essential will "soon" sell Home a standalone assistant similar to Amazon's Alexa and Google's Home. 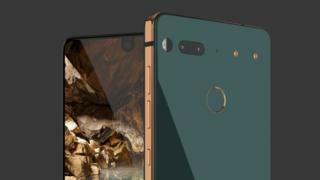 The Essential Phone is made from titanium and has a screen that stretches across most of the device, with minimal bezel. On the reverse, two magnetic dots are designed to make it simple to snap-on accessories, such as a 360-degree camera add-on the company is also offering. There are two built-in rear cameras - the combined lenses make it possible to take better photographs in low light, Essential said. The front-facing (selfie) camera is in line with competitors, offering an eight megapixel sensor. Mr Rubin promised that the titanium design made the Phone strong enough to not need a case. There are no logos on the device - something which aids the clean look of the phone, but will make it even tougher to build brand recognition among smartphone buyers who do not follow technology news. The Phone's specifications will not shake up the smartphone market in any meaningful way. However, Mr Rubin's reputation as the man who designed the most-used mobile operating system today will mean Essential will be a company to watch. In particular, its plan to launch a home assistant along with its own operating system, Ambient OS, could offer compelling alternative to Google's or Amazon's home assistant systems - at a time when the market is in its infancy (compared to smartphones where, most analysts agree, the market has reached its peak). In a blog post published on 2 May, the company's software systems architect Manual Roman said: "Ambient OS runs in your home and leverages your home network as much as possible. For example, it can interact with many home automation devices directly without having to go to the cloud. "Furthermore, it keeps user data locally whenever possible giving users more control over their privacy." Investors in the idea include iPhone-manufacturer Foxconn, and Chinese tech giant Tencent.